Buffett was recently asked about gold in a conversation with Ben Stein. 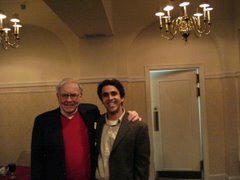 His answer was typical Buffett: short, direct, and steeped in common sense and logic. No need to for me to ramble any futher on this one. Read the rest by clicking here. Back after months of absence, (quality over quantity right?) here's another post that touches on a basic and valuable, yet often neglected investment process. We often hear of investing as a zero sum game: one investor's gain can ultimately be traced back to another investor's loss. In the timeless words of Gordon Gekko, "money is not gained or lost but merely transferred...." Yet there is another aspect to this "game" that is often not considered: the economic concept of opportunity cost. Simply, money which is invested today is done at the expense of all other investment options, including the benefits of being in cash. With a stock market up over 12% in two months, investors seem to be betting on Republican victories in Congress and Ben Bernanke's announcement of further monetary stimulus efforts. While both those outcomes seem likely to occur in line with investor anticipation, investment opportunity cost is very high today. The higher the opportunity cost, the more upside potential an investor should require. Understanding opportunity cost with respect to investment making decisions lends tremendous value to not only the quality of capital allocation, but investment portfolio composition. The key is in understanding that in investing sometimes the decisions you don’t make are just as valuable as the decisions you do make. The probability that the markets will suffer a pullback remains elevated for a host of reasons - an increasing deficit, unemployment, legislation, and so forth. Because of this real risk, investors must pay careful attention to the opportunity costs that come with every single investment decision. Capital that one invests today is money that can’t be invested next month. Of course, you could sell anytime but you would be at mercy of Mr. Market’s offer on that particular day. In other words, each incremental amount of invested capital has a higher opportunity cost than the capital that preceded it. So when I’m looking to allocate capital, with respect to my final 20% cash position, my upside requirements are going to be a lot higher than the preceding 20% and so forth. So unless I’m presented with arbitrage or special situation type investments, I’m looking for a two to three fold return before making further investment decisions at current market valuations. Sounds fairly basic and simple, right? Yet considering the trading volume still going on today, there is an incredible amount of investment activity going on, even from value investors. Yes I can identify stocks such as Vodafone (and other blue chips), who with its strong dividend yield along with its still unaccounted for 45% minority stake in Verizon Wireless (you can argue that the recent run up in share price is in response to this asset) and quality business models will still likely produce a 10% to 12% annual total return. And yes, a return of 10% to 12% a year is very attractive, but you got to have some holdings that will deliver much higher returns to offset the inevitable laggards in your portfolio year in and year out. A stock that delivers 12% annualized returns may do by being down 5% one year and up 30% the next. The value of understanding opportunity cost is that it will always ensure the adequate availability of cash when the pool of undervalued investments is at its highest. And availability of such opportunities rises as the market declines. So it makes sense from a value investing approach that as the higher the market goes and hence the smaller the pool of undervalued investment candidates, the more cash a portfolio should hold and vice versa. In reality, however, you see the exact opposite. The fear of buying during declining markets increases portfolio cash levels while the euphoria of bull markets reduces cash on hand. Thinking in terms of opportunity cost creates a stronger capital allocation discipline which in turn can often lead to above average performance results. When the opportunity cost of investing is low - meaning that the available returns from equities are strong enough to warrant action - odds are that the overall market is cheap and the pool of undervalued stocks is plenty. Today, the opportunity cost of investing is on the high side. The pool of attractively priced investments, in my opinion, is small and virtually extinct if you're dealing with $500 million or more. The best investments are likely already in your portfolio at buy prices significantly lower than today’s price. When faced with such a dilemma, investors should be extremely picky when making investment selections. .